Greetings from the Codex, and welcome to another front page announcement! A while back, I contacted all the members of the old Codex who were still in the group and asked if they were interested in contributing. One who replied was Hex_Enduction_Hour, and the result is that the Codex once again has an artist! As you may recall, they cancelled their previous Kickstarter for this game and have used that time to upgrade, upgrade, upgrade, the game compenents! Plus they were able to shave $5 off the price too! If you backed the cancelled Kickstarter, you'll certainly want to back this one! As an extra incentive, if you buy at least one copy of the game during the Kickstarter we will give you a free year of Site Supporter status here on Heroscapers (after the Kickstarter is successful, just PM your receipt to @Xorlof )! Note from Xorlof: y'all know about our very own Grungebob and you may know about his previous game, Mice and Mystics. In this article, he explains what he's been up to lately! Hello Heroscapers, Grungebob here! 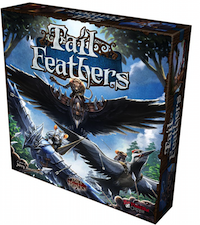 Xorlof has been kind enough to allow me to use the front page of Scapers to talk about my newest game release Tail Feathers. So some of you might not know who I am. My name is Jerry Hawthorne and I am a Heroscape fan. I got involved with Heroscape in 2004 before it was released, and I had the good fortune of meeting Craig Van Ness, Rob Daviau, and the other good folks at Hasbro who create cool games. I play tested for Hasbro and eventually freelanced for them on Heroscape. Many of you have probably noticed the promo for Hyground Tiles in the sidebar. If you haven't seen what these guys have to offer, check them out! They look very cool and have obvious use in Heroscape. If you want to discuss this project, the Hyground Tiles thread is here. This is going to be my first Kickstarter backing. All times are GMT -4. The time now is 12:42 PM.